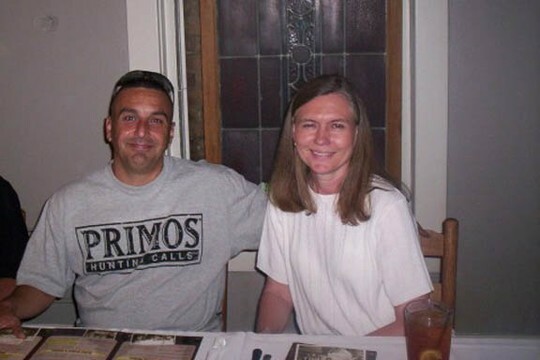 Mrs. Clara Flores, 52, formerly of Nacogdoches, passed away peacefully at her home San Antonio, Texas, Friday, April 18, 2008. Graveside services are planned for 11 a.m. Monday, April 21, 2008, with Bro. Sonny Scarborough officiating. Burial will follow in Oak Grove Cemetery. The family received guests at the funeral home Sunday evening from 5 until 7 p.m. Clara was born in El Paso, Texas on November 20, 1955, the daughter of the late Jack and Willie Bea (Linthicum) Ward. She served in the U.S. Army as a E-4 and spent three years in the Berlin Brigade. 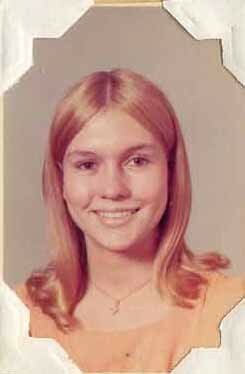 She worked as a Assistant County Auditor with Bexar County and also as the Nacogdoches County Auditor for six years. She handled several disasters, including the space shuttle Columbia crash and both hurricane Katrina and Rita. 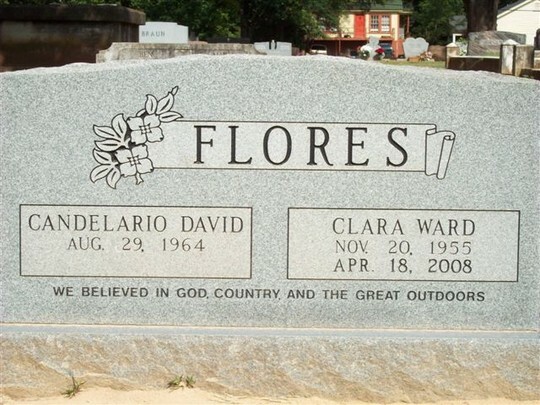 Clara loved her family, time with friends and the Nacogdoches community. She enjoyed the outdoors, gardening, hunting and fishing. Clara also enjoyed anything to do with numbers, trips to Vegas, playing poker and especially Texas Hold Em. 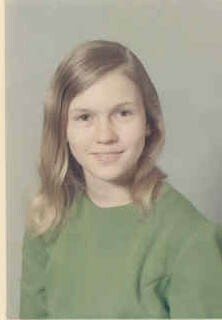 She is survived by her husband, David C. Flores of San Antonio, Texas; also by a brother, Jack Allen Ward of Merdian, MS.; numerous nieces, nephews, cousins, other relatives and many friends. 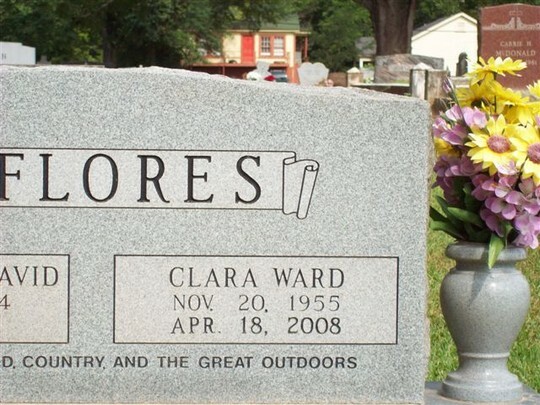 Clara is preceded in death by her parents, Jack M. and Willie Bea Ward. Laird Funeral Home. I keep Clara's funeral program at my desk to remind me of the beautiful smile Clara always had. I have so many memories of Clara. We had such good times together. But I will share the best one first. I was with Clara the night she dedicated her life to Christ. What a blessing to say that. It was right after we got our Driver's License and Clara asked me to pick her up on my way to a Campus Crusade for Christ that was held at NHS. When the invitation was given at the end of the service, Clara's eyes were filled with tears and she whispered to me that she wanted to walk down the aisle. Soon the evangelist asked those of us who were with someone who was down front, to come and stand with them. So, I walked down and stood with Clara and held her hand as she prayed and asked Christ to come into her heart. I remember after the prayer the light shining in her eyes. I am so glad that I got to share that time with her. I know without a doubt that she is in Heaven and I will see her again someday. Slumber party at Karen Tarry's house 7th or 8th grade. The talk turned to boys, of course. I knew of a boy from out of town who was spending the summer with some friends of my parents. CLARA CALLED HIM! They talked for 30 minutes or so, with him trying to find out who told her about him. He told her he was 'working out' when she called. Very impressive. He never knew how she found out about him (I hope, and I guess until he reads this now). CLARA AND I WERE BOTH MORTIFIED WHEN HE TRANSFERRED TO NHS OUR JR YEAR! You never know when those slumber party prank phone calls are going to backfire on you. Another sweet, beautiful, and compassionate friend. Memories of Clara bring such joy and smiles. I did not know Clara had died until today. It was like yesterday that i had talked to her and her husband. 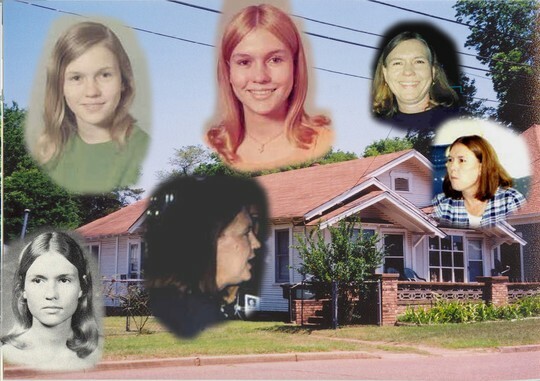 They were living in her mom's house in Nacogdoches across from the Best Water store and i was doing some work for the store. Clara will be missed greatly by me and her friends in Nac.